Here, we report three sibs with Alström syndrome from a consanguineous kindred of Turkish origin. Fasting blood samples were drawn and lipid and lipoprotein concentrations as well as routine laboratory parameters were determined at the Department Central Laboratory, University Clinics, Basel. C-peptide, insulin, islet cells, autoantibodies, growth hormone, insulin-like growth factor (IGF)-1, and insulin-like growth factor binding protein (IGF-BP)-3 measurements were performed at the Department of Research, University Clinics, Basel and at the Laboratory Professor Girard, Basel. For PCR amplification of the microsatellite markers D2S370, D2S2397, D2S285, D2S2152, D2S292, D2S2111, D2S2110, D2S286, D2S329, and D2S2161 on chromosome 2p12-13, oligonucleotides as published in the 1996 Généthon Microsatellite Maps were used.16 Genomic DNA (100 ng) was PCR amplified (94°C, 60 seconds; 55°C, 30 seconds; 72°C, 60 seconds; 25 cycles) using 1 μmol/l of each of the two oligonucleotides, 74 kBq [α32P] dCTP, 60 μmol/l of each of the dNTPs, 2.5 μl 10 × PCR buffer, and 0.4 UTaq polymerase (Qiagen). To the amplicons, 6 μl of denaturing loading buffer (95% formamide, 0.05% bromophenol blue, 0.05% xylene cyanol, and 20 mmol/l EDTA) were added. The samples were denatured for five minutes (95°C) and 3.5 μl were loaded onto 8% denaturing polyacrylamide gels, and run at 40 V/cm for two to four hours. After fixation, the gel was vacuum dried at 80°C for one hour and Kodak X-OMAT AR films were exposed (17-54 hours, room temperature). To confirm the localisation of the putative gene responsible for the syndrome in a family of a new ethnic group, a total of 10 microsatellite markers on chromosome 2p were analysed in the three affected sibs and their parents. 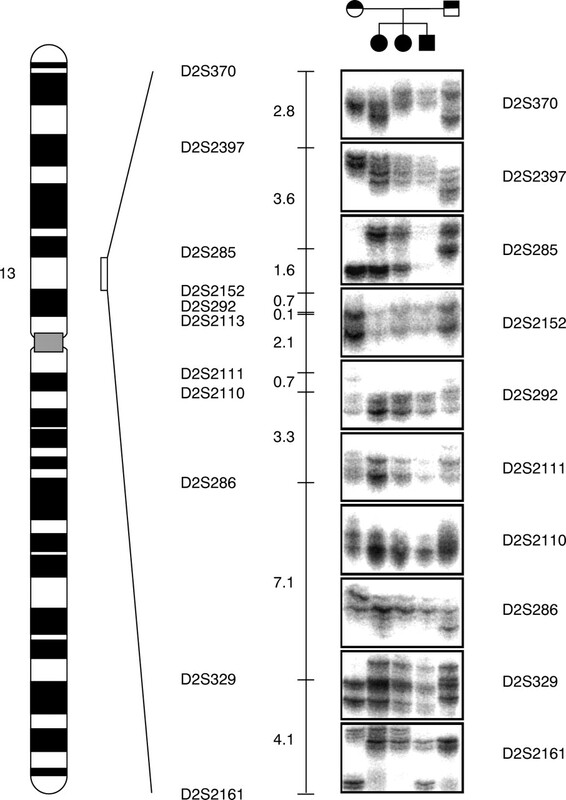 Fig 1 shows the microsatellite markers of the corresponding region on 2p12-13. In fig 2, the alleles of the microsatellites were numbered according to their relative sizes. Two recombinations flank the putative Alström region of 26.1 cM. Microsatellite marker patterns and the true scale genetic marker map of the corresponding region on 2p12-13. The alleles of the microsatellites were numbered and the relative allele size was determined; 1 represents the largest and 3 the smallest allele size. The boxed haplotype was inherited from the mother (I.1); a recombination was observed in II.3 between D2S329 and D2S2161. The unboxed haplotype was inherited from the father (I.2); a recombination was observed in II.1 between D2S370 and D2S2397. The three affected sibs of the family were followed over several years, which allowed a comparison of their phenotypic features at the same age. The parents showed no signs or symptoms of this syndrome. Table 1summarises the clinical and biochemical characteristics of the three affected sibs, determined in all three at the age of 15 years. All three sibs were affected by pigmentary retinopathy, neurogenic deafness, and obesity, but only one subject had manifest type 2 diabetes mellitus (case 1). In this sib, hypertriglyceridaemia and, in addition, marked hypercholesterolaemia were observed. An explanation of these striking intrafamilial phenotypic differences is the influence of other genes, that is, gene-gene interactions. Thus, we hypothesised an additional effect of a gene involved in cholesterol metabolism. The gene encoding the major modifier of plasma cholesterol levels, apolipoprotein E, was investigated. The R158C mutation (allele ε2) in the apolipoprotein E gene causes (together with triggering factors) so-called familial dysbetalipoproteinaemia (FDL) in its homozygous state; the R158C and the C112R (allele ε4) mutations both exert strong modifying effects on plasma cholesterol levels in their heterozygous state.17 In our family, as shown in table 1, the presence of the R158C mutation in the apolipoprotein E gene did not cosegregate with the clinical feature of hypercholesterolaemia, thereby ruling out the apolipoprotein E gene as a cause for the marked phenotypic differences (table 1). At the age of 15 years, type 2 diabetes mellitus was diagnosed in case 1 and impaired glucose tolerance in case 2, neither of which was observed in case 3, thus showing a striking intrafamilial difference in the age adjusted phenotype (table 1). In contrast to the differences between the three sibs, when they were 15 years old, in the lipoprotein metabolism and the diabetes/insulin resistance syndrome, the degree of pathological changes in other biochemical parameters and hormones was quite similar (table 1). The haplotype between D2S292 and D2S286 (fig 2, white numbers in black box) is homozygous and thus, probably, autozygous. This haplotype region spans 6.2 cM. D2S285 and D2S329 are flanking the region, since recombinations between D2S285/D2S292 and D2S286/D2S329, respectively, were observed. Based on these data, the Alström locus would be positioned in the region between D2S285 and D2S329 (dark grey shaded), corresponding to approximately 15.6 cM. Thus, we add to the evidence that the region is very likely to harbour the putative gene responsible for Alström syndrome. When compared to the region which was mapped by Collin et al,12 there was an overlap of 8.5 cM (between D2S285 and D2S286). Furthermore, when the results of Collin et al 12 and Macari et al 13 are combined, the overlap is reduced to 6.1 cM (between D2S2113 and D2S286). This 6.1 cM region has now been confirmed by three independent research groups in subjects affected by Alström syndrome from three different ethnic groups (fig 1). Hypercholesterolaemia, as in case 1, has not previously been described as a feature of Alström syndrome and was only observed in one of the three affected sibs. 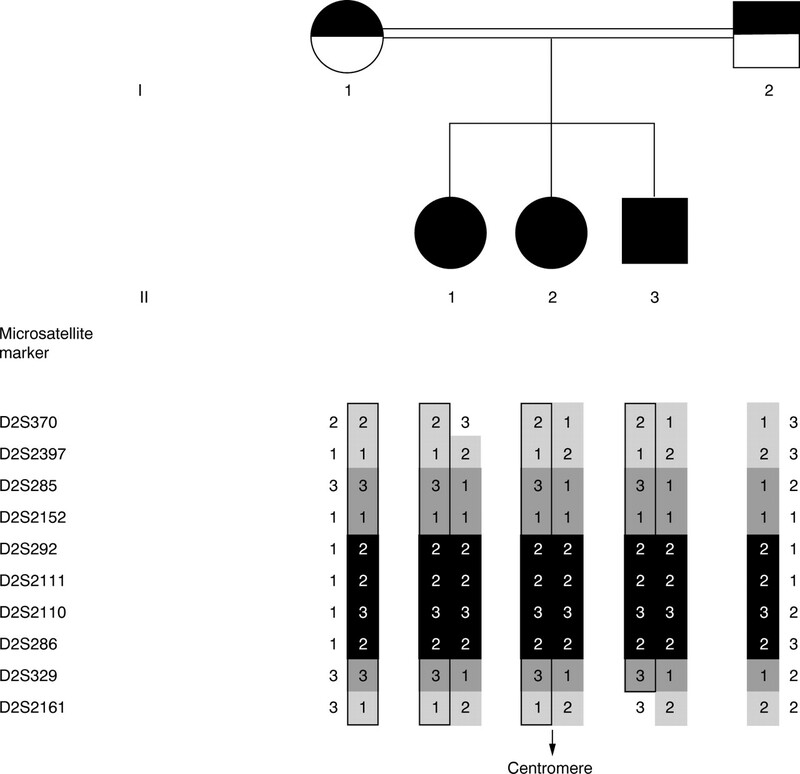 Interestingly, the apolipoprotein E R158C mutation, which is particularly rare in the Turkish population compared to central Europeans,19 was found in two of the three sibs. However, cosegregation with the most important modifier gene in lipoprotein metabolism, the gene encoding apolipoprotein E, was ruled out. Type 2 diabetes mellitus is one of the main characteristics of Alström syndrome, in contrast to Bardet-Biedl syndrome (where diabetes occurs in 4-6% of the cases), the renal-retinal dysplasia syndrome, Leber's congenital amaurosis, Laurence-Moon syndrome, and Usher syndrome.6 Missing islet cell autoantibodies and raised C-peptide and insulin concentrations, although to a strikingly different degree in our patients, suggested the presence of an insulin resistance syndrome in two of the three sibs (cases 1 and 2). Insulin resistance is known to occur with acanthosis nigricans (not only as part of Alström syndrome as in this family, table 1).20A hypocaloric, low fat diet resulted in improvement in carbohydrate metabolism with lower fasting glucose levels and lower HbA1c values in case 1 and was followed by an improvement in the lipoprotein disorder. However, hypertriglyceridaemia and hypercholesterolaemia did not entirely disappear. Despite the striking differences in the phenotype of the three sibs likely to be identical by descent (ibd) with respect to the putative Alström locus, further biochemical and hormonal changes were quite similar after adjustment to the age of 15 years. The observation of a biochemical growth hormone deficiency with insufficient growth hormone concentrations following arginine stimulation in all three sibs was in perfect agreement with the results of Alter and Moshang.8In our patients, a normal growth velocity in early childhood, advanced bone ages in puberty, and a markedly reduced final height were observed. However, IGF-1 and IGF-BP-3 levels were normal in all three patients. Alter and Moshang8 proposed that normal growth in early childhood and advanced bone age are the result of hyperinsulinism. They pointed out the similarity in structure and consecutive cross reactivity of the insulin- and the IGF-1-receptor. Based on the clinical relevance of growth hormone deficiency and the metabolic effects observed in our patients, growth hormone replacement was performed in cases 2 and 3. In addition to the expected increase in growth velocity, we observed a beneficial effect on lipoprotein metabolism. In other reports, unrelated patients with Alström syndrome showed highly variable phenotypic patterns,21 which partially resembled the Laurence-Moon22 and the Bardet-Biedl syndromes.23 24 However, since the localisation of the putative Alström gene on chromosome 2p12-13 was confirmed in three independent ethnic groups (Acadian, North African, Turkish), putative locus heterogeneity, as for example in the Bardet-Biedl syndrome,24 cannot be ruled out, but is not likely. As all three sibs in our family were very likely to be ibd for the Alström region, but nevertheless phenotypically heterogeneous with respect to hyperlipoproteinaemia and hyperinsulinism, a gene-gene interaction with one or several other genes independently inherited from the Alström gene is a possible explanation. In conclusion, we have confirmed the locus of the putative Alström gene. The parents were first cousins, and therefore a 6.2 cM region cosegregating with the Alström phenotype was very likely to be ibd. A striking feature in one of the patients was the marked hypercholesterolaemia in addition to the hypertriglyceridaemia in the range of that observed in FDL. The major modifier gene (the apolipoprotein E gene), however, was found not to cosegregate with this particular phenotype. In addition, improvement of diabetes resulted in an improvement of the lipoprotein metabolism as well. Therefore, the observed striking intrafamilial phenotypic differences in lipoprotein metabolism were caused by differences in the decompensation of the diabetes, rather than by primary problems of lipoprotein metabolism. Interactions between the putative Alström gene and genes involved in the insulin resistance syndrome are therefore more likely than interactions between the Alström gene and genes primarily involved in lipoprotein metabolism. A clinical benefit of a growth hormone treatment including an improvement in the lipoprotein disorder supports this hypothesis. The first two authors contributed equally to this work. This work was supported by the Swiss National Science Foundation grant No 3200-049125.96. ARM is supported by the SCORE (Swiss Clinicians Opting for Research) grant No 3231-048896.96 of the Swiss National Science Foundation. (1959) Retinal degeneration combined with obesity, diabetes mellitus and neurogenous deafness. A specific syndrome (not hitherto described) distinct from the Laurence-Moon-Bardet-Biedl syndrome. Acta Psychiatr Neurol Scand 34 (suppl 129) 1–35. (1969) Familial syndrome of primary testicular insufficiency with normal virilization, blindness, deafness and metabolic abnormalities. N Engl J Med 281:969–977. (1973) The Alström syndrome. Report of three cases with further delineation of the clinical, pathophysiological, and genetic aspects of the disorder. Medicine 52:53–71. (1991) Hepatic dysfunction in Alström disease. Am J Med Genet 40:421–424. (1997) Hepatic dysfunction in two sibs with Alström syndrome: case report and review of the literature. Am J Med Genet 69:13–16. (1986) Ophthalmologic and systemic manifestations of Alström's disease. Am J Ophthalmol 102:482–490. (1990) Alstrom's syndrome: further evidence of autosomal recessive inheritance and endocrinological dysfunction. J Med Genet 27:590–592. (1993) Growth hormone deficiency in two siblings with Alström syndrome. Am J Dis Child 147:97–99. (1984) The Alström syndrome: ophthalmic histopathology and retinal ultrastructure. Br J Ophthalmol 68:494–501. (1987) Late onset dilated cardiomyopathy in a unique familial syndrome of hypogonadism and metabolic abnormalities. Am Heart J 114:1522–1524. (1996) Natural history of Alström syndrome in early childhood: onset with dilated cardiomyopathy. J Pediatr 128:225–229. (1997) Homozygosity mapping of Alström syndrome to chromosome 2p. Hum Mol Genet 6:213–219. (1998) Refinement of genetic localization of the Alström syndrome on chromosome 2p12-13 by linkage analysis in a North African family. Hum Genet 103:658–661. (1990) Restriction isotyping of human apolipoprotein E by gene amplification and cleavage with HhaI. J Lipid Res 31:545–548. (1995) Differences in the phenotypic characteristics of subjects with familial defective apolipoprotein B-100 and familial hypercholesterolemia. Arterioscler Thromb Vasc Biol 15:1719–1729. (1996) A comprehensive genetic map of the human genome based on 5,264 microsatellites. Nature 380:152–154. (1992) The role of apolipoprotein E genetic variants in lipoprotein disorders. J Intern Med 231:653–659. (1988) Genetics of populations. An introduction to human genetics. (Harcourt Brace Jovanovich, San Diego), pp 500–525. (1996) Polymorphisms of apolipoproteins A-IV and E in a Turkish population living in Germany. Hum Genet 98:285–290. (1976) The syndromes of insulin resistance and acanthosis nigricans. Insulin-receptor disorders in man. N Engl J Med 294:739–745. (1997) Genealogy, natural history, and phenotype of Alström syndrome in a large Acadian kindred and three additional families. Am J Med Genet 73:150–161. (1998) A case of familial Bardet-Biedl syndrome (obesity, slight mental retardation, polydactyly, retinitis pigmentosa and renal failure) with insulin-resistant diabetes mellitus. Minerva Endocrinol 23:83–92. (1994) Alstrom syndrome: a case misdiagnosed as Bardet-Biedl syndrome. J Pediatr Ophthalmol Strabismus 31:272–274. (1998) Canadian Bardet-Biedl syndrome family reduces the critical region of BBS3 (3p) and presents with a variable phenotype. Am J Med Genet 78:461–467.